In the First Round at the McLean Racquet & Health Club in Virginia, Farah Abdel Meguid defeated top local junior player Aalia Husain (USA) in a businesslike display of power and accuracy 3-0: 11-2, 11-0, 11-4. The plucky junior occupied most of her time digging balls out of the corners. Husain had a few good shots which caught the Egyptian off guard but the American could have used many more to have a chance of winning against her much stronger and more experienced opponent. Emilia Soini expertly dispatched another top local junior player Shalika Neelaveni 3-0: 11-3, 11-3, 11-2. Soini executed a series of clinical lobs, drops and last-second flicks of the wrist to twist and turn the American and tire her out. Again experience ruled the afternoon. Nicole Bunyan had a good tussle with Margaret Gerety, the top women's player in the National Capital Region. 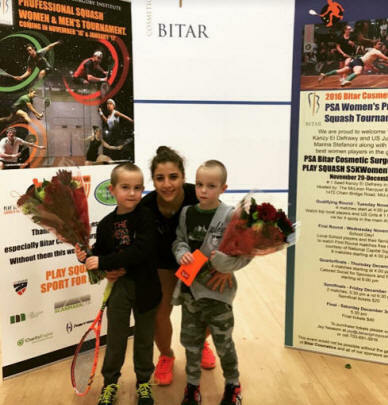 Gerety capitalized on her years of experience in competitive squash, faring better than the other juniors in previous matches. Bunyan worked up a good sweat over many long rallies, having plenty of firepower to dispense, and winning 3-0: 11-7, 11-1, 11-6. Catalina Pelaez defeated MRHC's Club Champion Leslie Connolly also in three games: 11-4, 11-4, 11-2. Weenee Low and Elani Landman had a clean, hard match. Low - the wildcard - varied the pace, stretching Landman continuously to the perimeter of the court. Landman responded with attacking volleys that deprived Low of opportunities to capitalize on her variations. Low got up 10-6 in game 2 but Landman stormed back to win it in a very close tie break. It was nip and tuck in game three, Low recovering from a 7-9 deficit and knotting the score at 9-All, but the effort she had expended in trying to contain Landman throughout the match caught up to her. She slowed just half a notch and Landman powered on to win 11-7, 12-10. 11-9. Hanna Chaudhry commented on her 3-0 loss to Lume Landmanhat Lume made the ball "hotter than usual" and kept her scrambling around and into the corners. Chaudhry did fine when the pair traded length but eventually Landman would get in front of her and carve in low winners. Lume prevailed 11-4, 11-6, 11-0. USA #1 Junior Marina Stefanoni and her father drove 6 hours from Connecticut before she stepped on the court with #2 Seed Sadia Gul. This was Gul's maiden tournament in the US. She had arrived to 5 days before to acclimatize. The gallery buzzed with anticipation that the American - ranked #6 in World Junior Girls -- and who turned only 14 today - had a chance of upsetting the speedy Pakistani. One could see that Stefanoni had a rare sense of anticipation that either you are born with or you aren't. Gul played very well but she wasn't able to rattle Stefanoni despite her crushing length and deft drop shots. In game 3 Stefanoni sprinted to 9-4, then Gul dug in to reach 8-9. Stefanoni was unflappable....10-8 Stefanoni but Gul tied it up. It ended in a very close and entertaining three games for Stefanoni: 11-8, 11-7, 13-11. Top seed Kanzy El Defrawy enjoyed the afternoon off and was the only player to earn a bye in the first round.